Size (inch) : 4.13 x 4.53 "
Halas lace is a type of needle lace. It first appeared in 1902 in the town of Kiskunhalas, Hungary, colloquially known as "Halas". It is one of the most exclusive hand-sewn products in the world. It is a unique, entirely handmade needlepoint lace that uses the finest linen thread, and a superfine needle, barely visible to the naked eye. 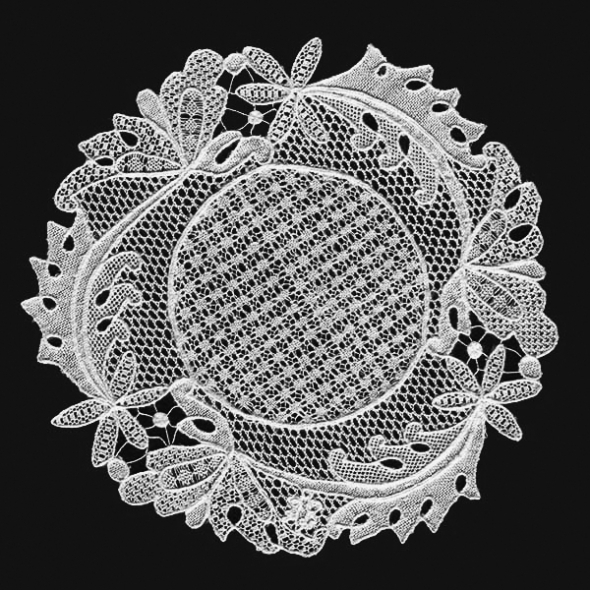 The rare and prized Hungarian Halas Lace, which has gained widespread recognition and international appreciation, is considered a worthy rival to the highly esteemed Brussels lace. The needlework of Halas Lace is top secret; only a few women and girls in Kiskunhalas, hardly a dozen, know it at one time. The creation process requires immense skill and patience. A small, palm sized butterfly can take over two days to create, while a large piece may take hundreds of hours to complete. It is incredibly precious, and per gram, it competes in price with gold. It is a blending of the rich motifs and compositions of Renaissance, Baroque and Hungarian aristocratic embroidery and the styles of the Secession. The more than sixty types of stitches in Halas Lace. During the last 115 years more personalities has given as present the Halasi lace from the Hungarian state. For example Alice Roosewelt, king Umberto, Charles I of Austria and Queen Zita, Juliana Dutch queen. In 1996 Pope John Paul II, in 2000 Hitachi the Japanese duchess, in 2004 Queen Elisabeth II, in the recent past Laura Bush, the Jordanian queen, as well as the wife of the presidents of republic of Lebanon, Cyprus, Austria, and Czech Republic. All Halas lace contains small fishes placed somewhere in the lace, it means the lace is original.